Home » Offbeat » Now we need to clean Space Junk?!? Space junk has made a mess of the Earth’s orbit and now experts believe its about time that we start to think about cleaning it up. We humans still haven’t learnt how to keep our cities clean, as a matter of fact not even our own home. 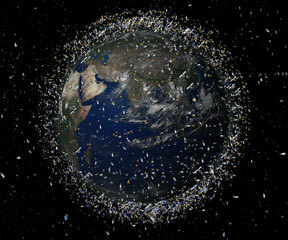 And now we have to think about cleaning the junk in Earth’s orbit. “We’ve lost control of the environment,” said retired NASA senior scientist Donald Kessler, who headed the National Academy of Sciences report. Since the space age began 54 years ago, civilization has littered the area just above Earth’s atmosphere with leftover boosters and other parts that come off during launches, as well as old satellites. When scientists noticed that this could be a problem, they came up with agreements to limit new space junk and those plans had been working. “Those two single events doubled the amount of fragments in Earth orbit and completely wiped out what we had done in the last 25 years,” Kessler said. All that junk that means something has to be done, “which means you have to look at cleaning space,” said Kessler. The study only briefly mentions the cleanup possibility, raising technical, legal and diplomatic hurdles. But it refers to a report earlier this year by a Defense Department science think-tank that outlines all sorts of unusual techniques. The report by the Defense Advanced Research Projects Agency is called “Catcher’s Mitt” and it mentions harpoons, nets, tethers, magnets and even a giant dish or umbrella-shaped device that would sweep up tiny pieces of debris. While the new report does not recommend using the technology, Kessler said it is needed. He likes one company’s idea of a satellite that is armed with nets that could be sprung on wayward junk. Attached to the net is an electromagnetic tether that could either pull the junk down to a point where it would burn up harmlessly or boost it to safer orbit. Previous: Google Shuts Down Google Desktop and 9 Other Services!